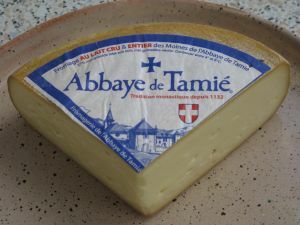 Abbaye de Tamié is a soft cheese made from unpasteurised cow's milk, similar in style to Reblochon and produced exclusively by the monks of Tamié Abbey, near to Albertville in the Savoie département, in the French Alps.
" Petit Tamié" sold individually. Unpasteurised whole milk is warmed to 34 °C. Cultivated fermenters, made at the abbey, are added. This is then left to coagulate for about 90 minutes. The natural rennet is added to obtain the solids. When this is sufficiently firm, the curdle is cut using special knives, to separate the curds and whey. The time and the speed of the cutting regulates the size of the curds to that of a pea. The mixture is then left for 20 minutes to drain, then placed in moulds with small drainage holes and pressed by machine to remove any remaining liquids for about 4 hours. The whey is not wasted, but processed into methane which is used to heat the abbey’s hot water system. The cheeses are removed from the presses and put onto pallets which are then immersed in a bath of salty water for 2 or 3 hours, according to the size. Salting has several functions: it affects the taste, crust formation and is a preserving agent. Cheeses are aged in the vaulted cellars of the abbey where the temperature is maintained at 14 °C, with high humidity. They will be turned manually every other day. To maintain the crust and encourage the development of the mould on the surface, the cheeses are again bathed in brine and then rubbed and returned to the shelves to mature. The mould is naturally present in the cellar. When they have attained their optimum maturity, they are packed and labeled by hand. The label conveys important manufacturing information and the best-before date (about 45 days after packing).